So just when we thought we were going to sail through this winter with zero snow, we got pummeled a few weeks back. 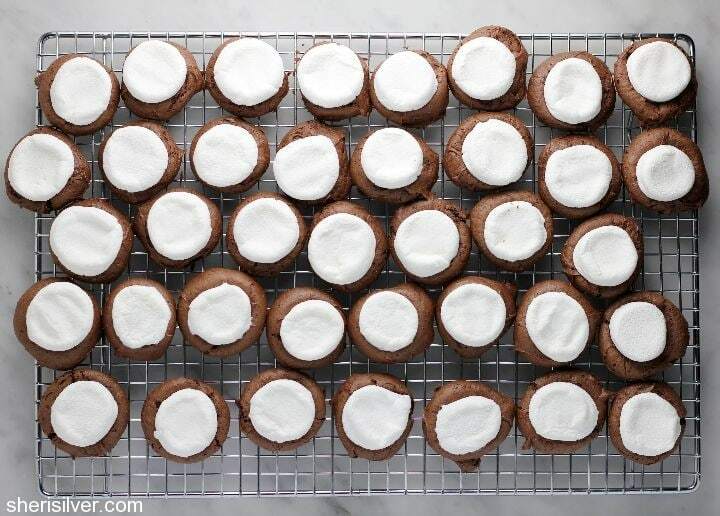 These cookies taste EXACTLY like a cup of hot chocolate, and were declared by all – from friends who came for dinner, to our fave babysitter – to be winners. Easy to make and they keep for days – not that they will last that long. But don’t wait for a snowstorm to try them! I also wanted to share with you an amazing find, if you are doing any kind of gluten-free baking. It is Cup 4 Cup Multi-Purpose Flour. It is FANTASTIC, and has made our foray into gluten-free eating a joy. When it came to cooking, I was not overly concerned about making the transition to gluten-free. So many foods are naturally GF, and I knew that pastas and breadcrumbs had come a long way in terms of flavor and texture. But baking? I was worried about weird flavors, gummy textures and off colors. Several friends highly recommended Cup 4 Cup so I started with it from the get-go. I waited to share this with you till I made a bunch of recipes using it, and I can recommend it without hesitation. In addition to these cookies I’ve made Fay’s cookies, these doughnuts, this cake and more. And you truly would never know the difference. I’m thrilled, and know you will be too! adapted from OMFG. So Good. Make the cookies: Pre-heat oven to 375 – line 3 – 4 baking sheets with parchment paper. In the bowl of an electric mixer, beat butter and sugar till light and fluffy – add egg, milk and vanilla and beat again till well combined. Scrape down the sides. Add the flour, cocoa powder, baking soda, malted milk powder and salt – beat till well combined and scrape down the sides. Drop batter in tablespoons on your prepared sheets – spacing about 2″ apart. 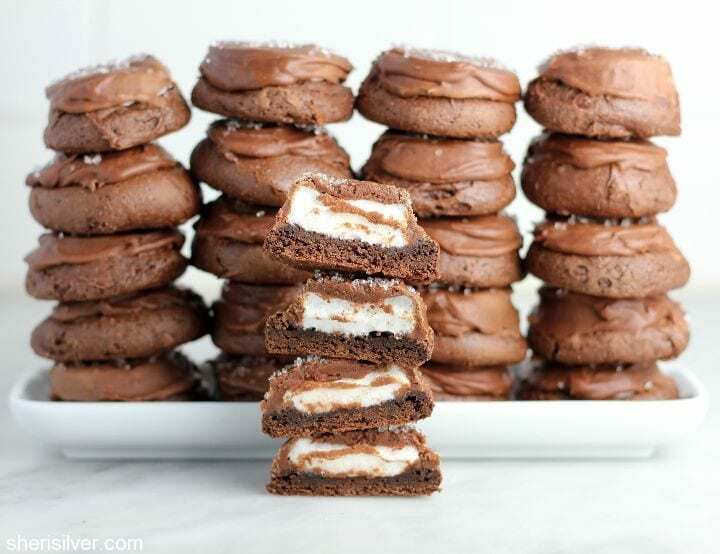 Bake for 8 minutes, remove sheet from oven and press a marshmallow half onto each cookie. Return sheet to oven and bake for an additional 2 minutes. Remove sheet from oven and let cookies cool for a few minutes before transferring to a wire rack to cool completely. Repeat with remaining batter. Make the frosting: Place all ingredients in the bowl of your mixer and beat till smooth. 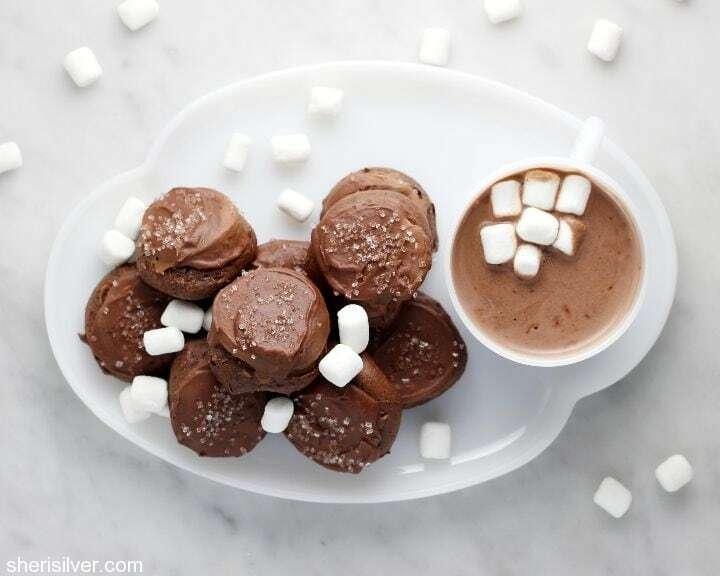 Spread enough frosting over each cookie to completely cover the marshmallows. Sprinkle with sanding sugar if desired. Let frosting set. Cookies will keep in an airtight container at room temperature (layers separated with wax paper) for a a week. Want more cookies? Check out my Pinterest board! These look delicious, but malted milk powder usually has gluten in it (barley)… Did you use something else? I know – we are lucky to not have any gluten sensitivities around here (just peanuts :() – so I wasn’t concerned. What I’ll tell you is that you can eliminate the malted milk powder and the recipe will be just as delicious. Unfortunately I’ve been unable to find a substitute (and I’ve tried!!). Let me know if you try them with the change, and how they turn out!